Keywords: Application: City Council balanced scorecard, Manufacturing Company balanced scorecard, Management team meetings, monitoring the external environment, consensus, anticipating uncertainty and risks. This white paper is about planning and managing uncertainty in a changing environment. It provides two contrasting case studies demonstrating the role of the Tangible Future in Fourth Generation Balanced Scorecards. Both Peterborough City Council and Unite Modular Solutions use a detailed picture of the future to build a common understanding amongst the management team before setting the rate of ambition for the strategy, strategy map and balanced scorecard. However, one uses a fixed view of the future setting destination statements at points in time, whilst the other recognises that the future is uncertain and needs to be monitored for changes to the management team’s assumptions about their strategy. Peterborough City Council took a fifteen year view of the development of the city and the city council’s role. This case study is typical of third generation balanced scorecards using what sometimes gets called a destination statement or future statement. In contrast the other client, Unite Modular Solutions, took a five year view of a manufacturing company’s market. Their approach, A Tangible Future, goes further than a destination statement by identifying the assumptions and uncertainties in the environment and market. This expanded the management team’s balanced scorecard, so they could monitor the external environment, to ensure their strategy was still appropriate, as their strategy was implemented. 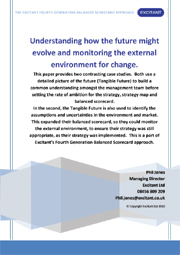 Tangible Futures and their use in developing monitoring systems for the external environment are a part of Excitant’s Fourth Generation Balanced Scorecard approach.